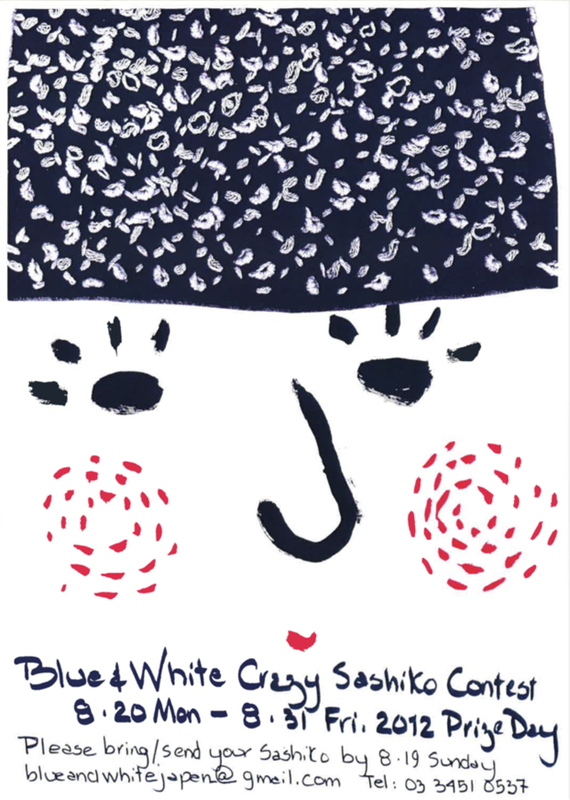 Our Blue & White invitation for a Crazy Sashiko Competition was received with enthusiasm and a wide range of masterpieces arrived from the loyal followers of Blue & White. But Sashiko is basically serious, purposeful sewing, not crazy. It is a simple running stitch sewing to strengthen and reinforce cloth, sometimes to mend, sometimes to thicken clothing for wearing, warming, and working, cloths for carrying and sleeping or using. 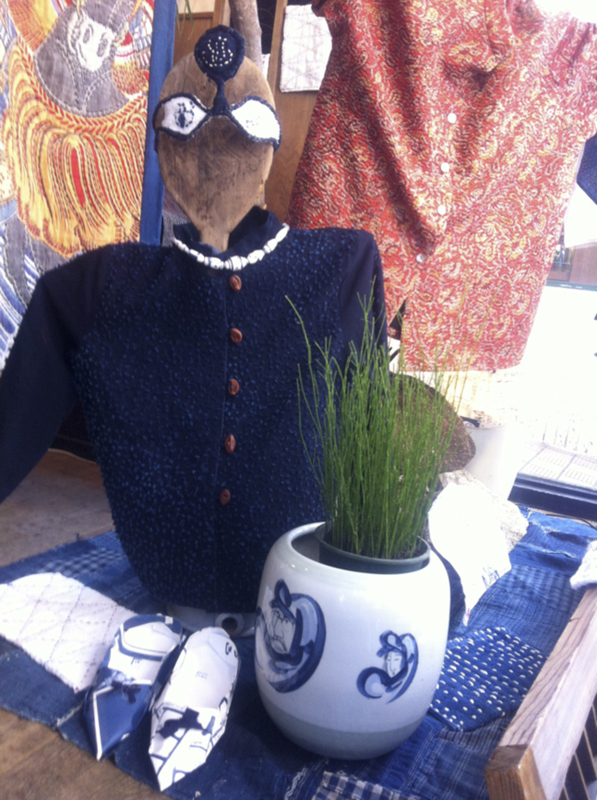 Sashiko is functional and made to work. But it is summer at Blue & White. Why not have fun, we thought, so we invited friends and neighbors to a Crazy Sashiko event. More than 65 entries arrived and we displayed them in our ever-changing window. 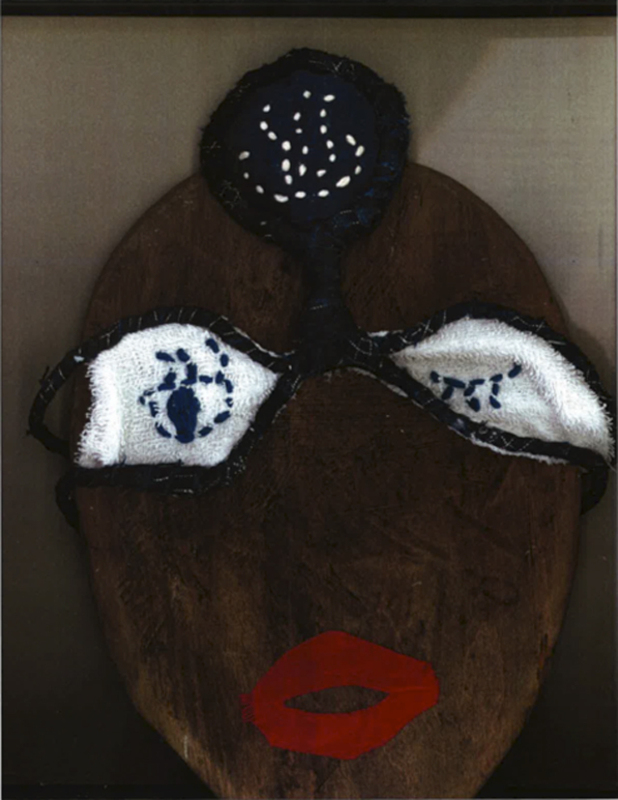 The result is a fun and eye- stopping, idea filled window of a wide swath of stitched creations loosely called Sashiko. Some are traditional, some are works of impressive patience and care. Some are slightly crazy, but all are joy giving and express inner thoughts. The works are handsome and off the normally stitched sashiko path. They are filled with heart and dexterity. 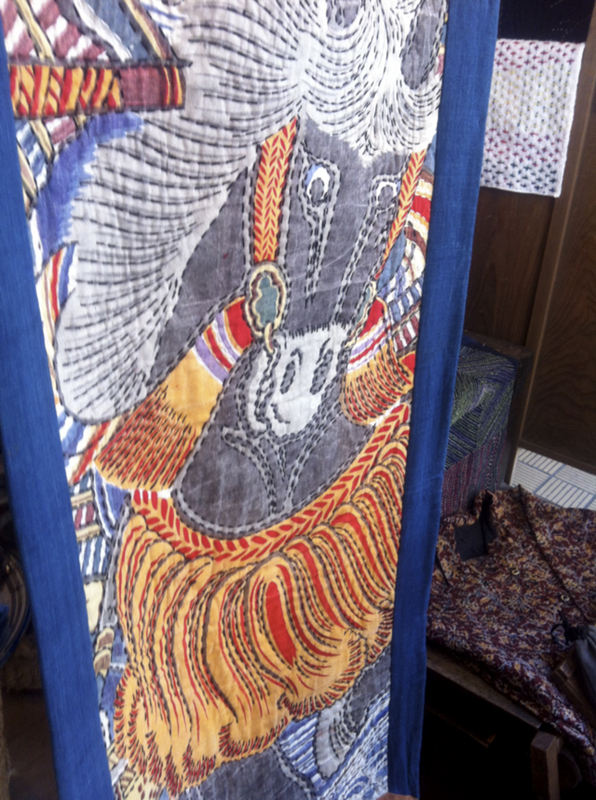 The most touching were the works of Reiko Inaba who does handsome applique work of kimono and fish, drawing from her treasure mounds of antique kimono and under wear, mosquito netting and futon material. She arrived with her husband first thing on the first morning to see the display, embarrassingly not yet up, on her way to hospital for yet another checkup. Stopping in at Blue & White came first on her priority list. She has been creating appliqued pieces for us for maybe 15 years or so, always bringing along vegetables she has grown, fish she has smoked, fruit she has dried. Until recently her energy has been unflagging. Her Sashiko is bouncy. Her eye for old fabrics knowing. Wanting to do something different this time, she decided to use strips of torn silk kimono material for her thread and produced a colorful collage of design and texture which warmed my cockles with its warm individuality. It sits unassumingly beside a carry bag of gentle sashiko squares by Megumi Kajikawa, a stalwart staff member of Blue & White. 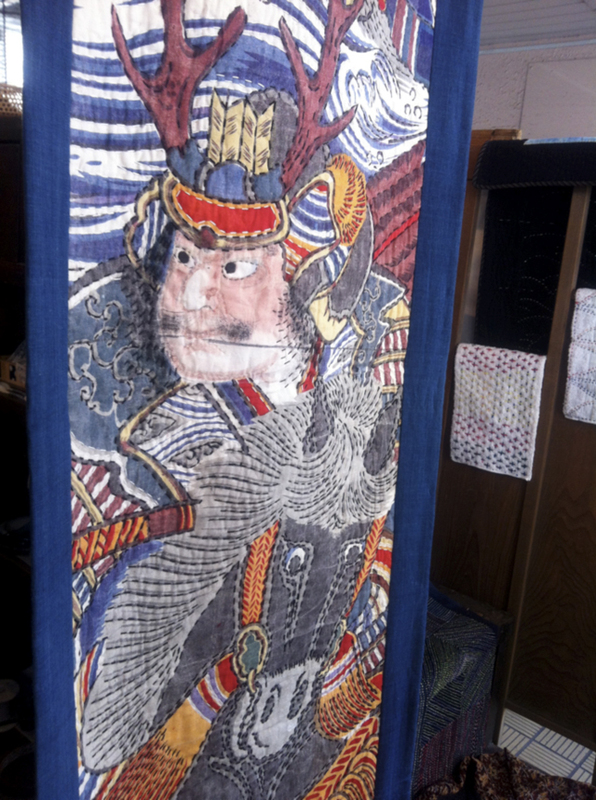 Next to them is a thundering boys’ day banner that has been stitched in thick fairly widely spaced stitches as if to emboss the already dynamic composition of a fearless samurai leading the battle on his bright eyed stallion. Got your back! The reverse side of the Samurai is a peaceable scene of rising sun and sails at sea. Zokin, or dustrags are a popular canvas for sashiko. The stitches connect two sides of an old towel when doubled over, and give the finished cloth style and grace while reinforcing it for hard work. The color of work: the beauty of function. Below the Zokin is a small and playful indigo furoshiki by Blue & White’s favorite artisan, Reiko Okunushi. 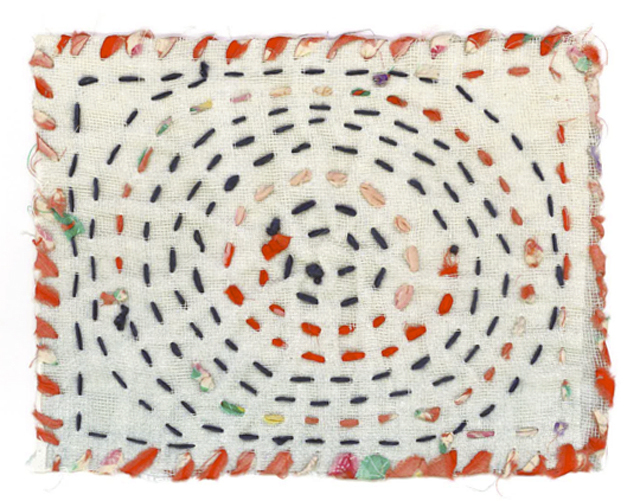 Thick white unbleached cotton thread, double ply, makes strong and whimsical patterns on the square of indigo that can be used as a wrapping cloth or even a small table cloth to lay down a picnic for two. Everyone had made such an effort – a group of grannies had painstakingly stitched their dustcloths, newly recharged by the challenge. 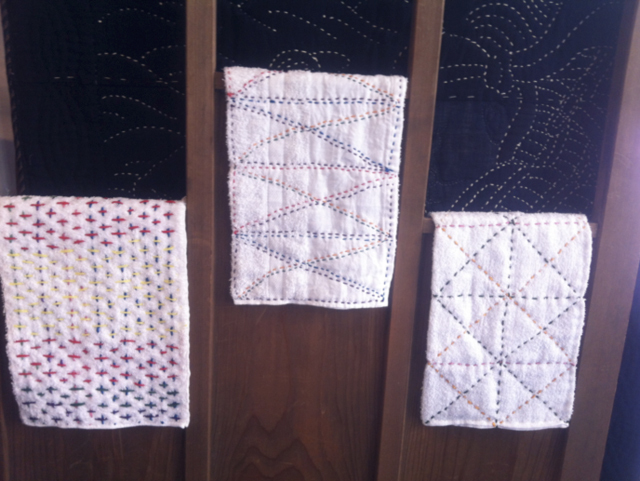 22 women from Gungendo in Shimane handed in a long, patiently patched panel of sashiko. 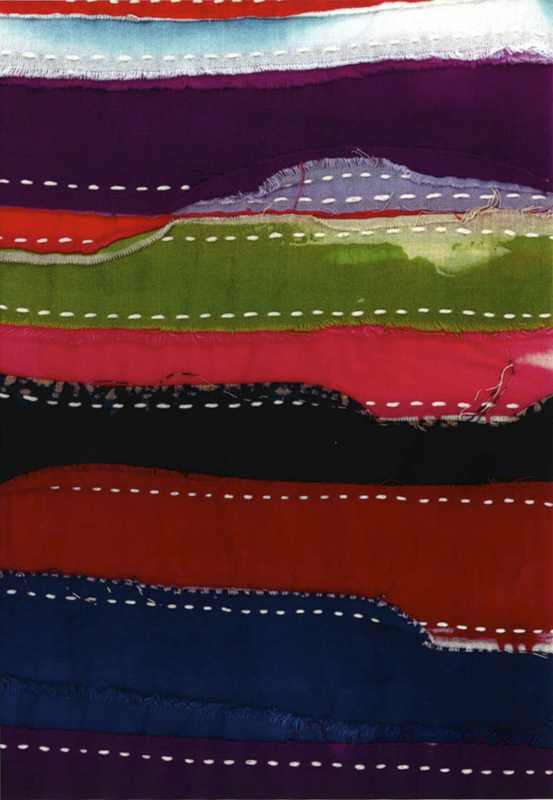 There were clothes and noren and crazy glasses and strips of bright colored ends of tenugui stitched together with white sashiko thread – folded over it could be a sensational obi on an indigo kimono, we thought, for someone who dared stand out in a crowd. All were so good that we realized there should be prizes for everyone. 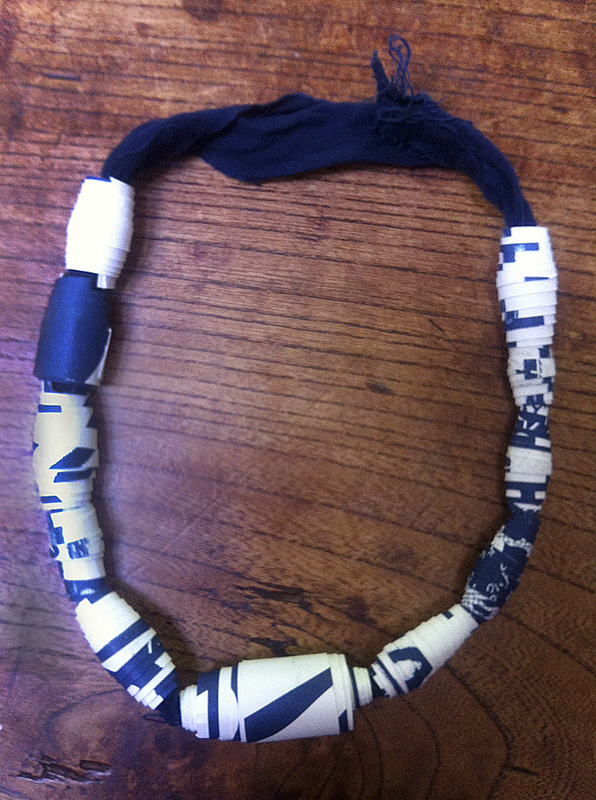 So we made 45 original blue and white necklaces made of long rolled triangles of the thick paper of leftover pages of Blue & White calendars. No overnight affair. And while all the participants got a necklace or a tenugui, we did give 5 honorable mentions for creativity, imagination, sensitive use of materials, indigo patchwork originality, and sashiko perfection. 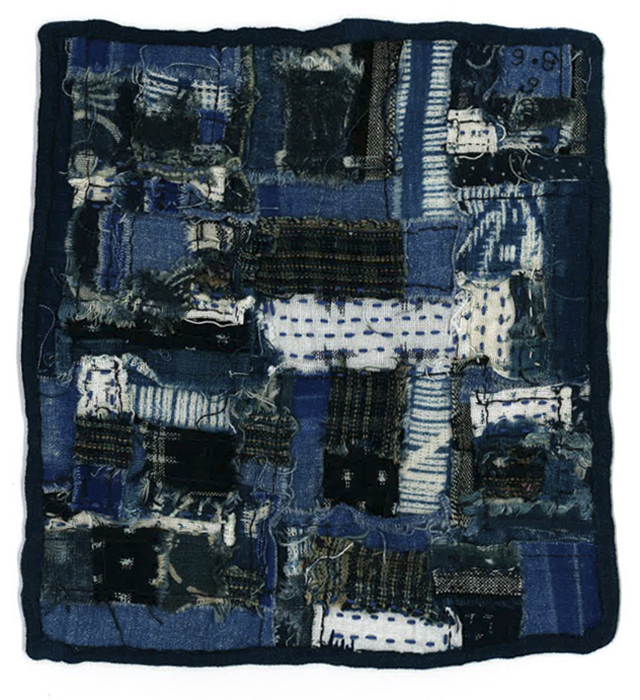 The Blue and White Prize: a wonderfully original Blue & White noren of random odd shapes of stuffed and stitched indigo hanging on braided twists of rope – too wild and unwieldy to photograph. This was the first Crazy Sashiko event at Blue & White, but it was received with such gusto and enthusiasm from passersby that we look forward to making it annual. We may even find a way to manage international entries. So wherever you are, think Crazy Sashiko next August! 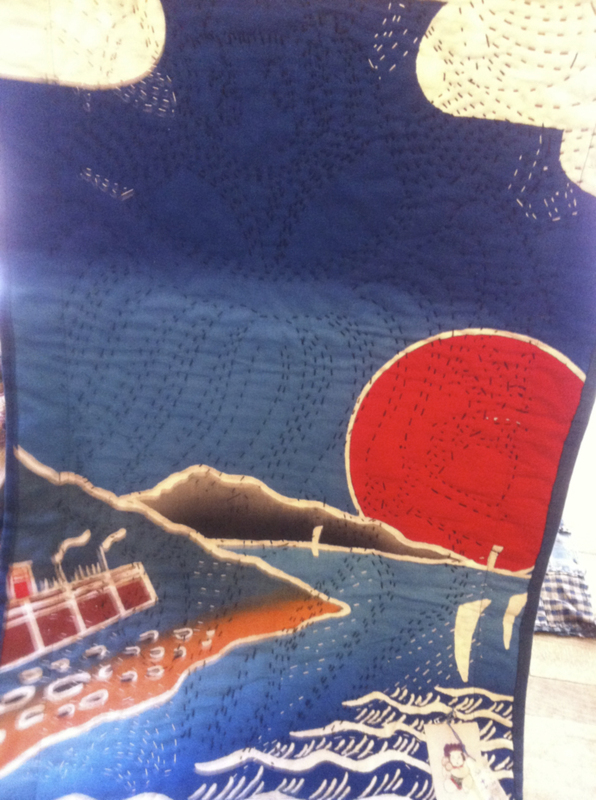 And many of these sashiko masterpieces will be featured on our 2013 Sashiko calendar that will come out in October. It will give a burst of original creativity every month for the kitchen, the study or your work room. Please let us know when the calendar is available for shipment to the USA. Terrific show, thoroughly enjoyable. It will be ready in about three weeks and we will post it here for all to know and order. It is colorful and happy this year. And horizontal, some people will be relieved to hear after last year’s vertical experiment. So much to do – so little time ! And so very much to tell of the good things of Japan. New blog in the wings. Come back soon and let’s make blogs happen. Glad, glad to know you’re filled with exclamation points ! I love it! so glad for all the photos…. come on girl – get sewing ! And get thinking of when you will come to Japan ! Novices most welcome. YOu are not hindered by long entrenched ways of doing things. Your work will be fresh and spontaneous. Next summer/fall we will announce it on the blog for all to rally to, in plenty of time for you to get creative – and crazy ! Brilliant, colourful,inventive and inspiring for me and my lovely granddaughter to get creative here too in London! Thank you, we look forward, always, to opening these lovely visual messages from you all at Blue and White Tokyo and hope to visit one day in the not too distant future. What a treat that would be! Thought I had already written, but somehow it disappeared. So glad to hear we are reaching you in London. Do give it a try with your Granddaughter. Somehow they are most clever. We will post the Crazy Sashiko project again next year, so get thinking about it. And our Sashiko calendar will be out in a few weeks. Do think of coming with your Granddaughter in the near future. We are always waiting, 7 days a week ! 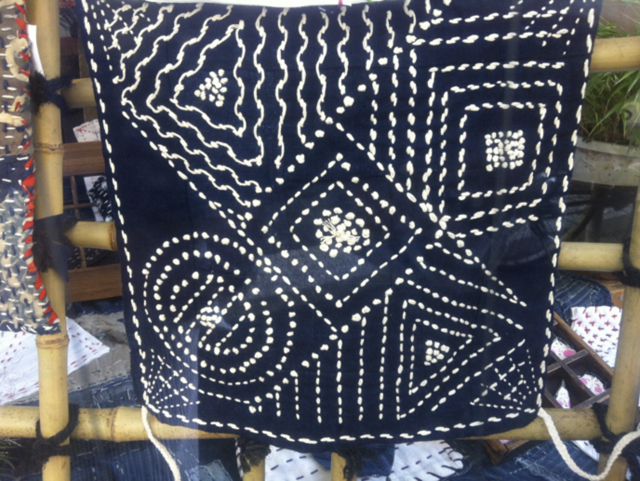 How creative people have been with sashiko, things like this will promote it wonderfully. It is a wonderful way to express what is inside. A gift from the ancients of Japan, India, China, Bangladesh, Pakistan. But somehow I find the heart and sense of design of Japan the most irresistible. 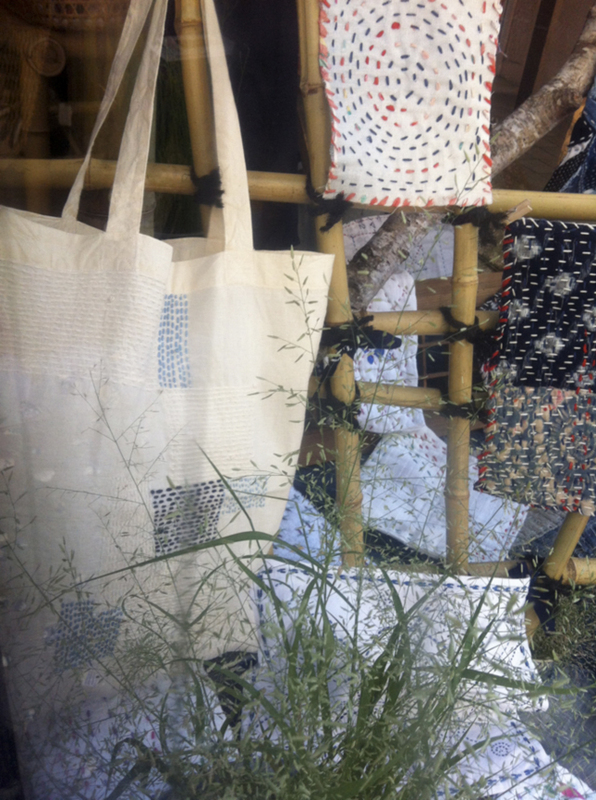 Come and join the Crazy Sashiko project next year. Niigata ga SUBARASHII tokoro desu ! Okage sama de Jill to isshouni totemo yorokonde hobo e ikimashita. Arigato ! Arigato ! Arigato ! Banzai Ike Akiko to Tomoko ! Not officially, but let me check on the ones you might be interested in. 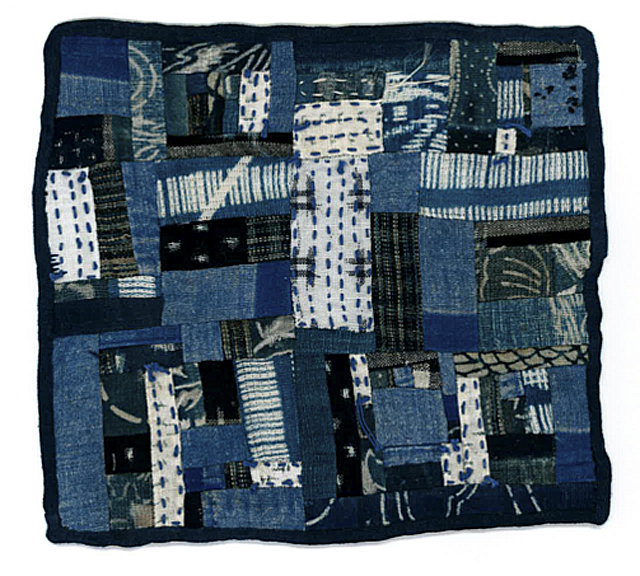 Dear Blue & White, One of my most favorite days of my life was sitting with ladies in northern Japan sewing. I went to some temple rummage sales to find old pieces of indigo and hand-woven nets. Please please tell me if you have the calendar, and keep me connected to all of you. Oh Mallory. When was this and where? Are there photos? I love the image. and YES DO stay connected ! AND you got me thinking about my favorite days. the very best to you !